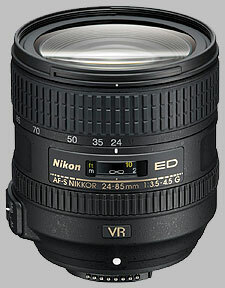 Nikon released the 24-85mm ƒ/3.5-4.5 VR in June of 2012, providing an economically priced wide-to-medium zoom lens for FX (full-frame) camera bodies. Nikon has a long history of lenses in this range, beginning with the 24-85mm ƒ/2.8-4 in 2000, which is still available today; a less expensive version of the 24-85mm ƒ/3.5-4.5, without VR, has now been replaced by the VR version. The lens takes 72mm filters, ships with a petal-shaped hood, and is available now for around $600. The Nikon 24-85mm ƒ/3.5-4.5 VR provides generally quite sharp images. Performance is better when the lens is mounted on the sub-frame (DX) D7000, as the lens' corner performance is not seen by that camera's sensor. Used wide open on the D7000, images are almost tack-sharp, with just a hint of corner softness at the 24mm focal length. Zooming to 50mm or stopping down even just a half-stop solves this problem and you're left with super-sharp images. The 70mm and 85mm settings aren't as sharp, though it's just a matter of degrees; performance is still excellent, though curiously, it's slightly better at 85mm than at 70mm. Mounted on the full-frame D800 exposes the lens' true nature. Used at the widest aperture setting at any focal length produces some level of corner softness: from considerable at 24mm, to just slight at 85mm. Central sharpness is very good when used wide open, and gets somewhat better when stopped down to ƒ/5.6 or ƒ/8, but you don't get the same tack-sharp images with this lens when used with the D7000. In this case, we could be seeing the sensor out-resolving the lens. Diffraction limiting sets in by ƒ/11, though the effects are really noticeable until ƒ/16: fully stopped-down performance is generally best avoided, as it produces consistently average performance. The use of ED glass helps a bit here, as chromatic aberration is kept quite low on both the D7000 and D800 bodies. It's slightly more prominent at the wide angle (24mm), and is less obvious as the lens is zoomed in and stopped down. CA presents as purple fringing in areas of high contrast, in the corners. The Nikon 24-85mm ƒ/3.5-4.5 VR doesn't show any signs of corner shading on the D7000, regardless of the focal length chosen. On the D800 however, there is considerable corner shading at several focal lengths and apertures. The worst offender is 24mm and ƒ/3.5, where we note extreme corners that are over a stop darker than the center of the frame. Any other setting is better than this, but the only way to shoot images with this lens that don't have any notable corner shading is at 50mm or longer, and stopped down to ƒ/8 or smaller. Happily, most post-processing programs offer correction capability to offset corner shading. Wide angle lenses also have to contend with distorted results, and the 24-85mm has its share of issues with distortion. Distortion is manageable on the DX camera body, but on the FX D800, it's quite severe. Barrel (bloat) distortion is prominent when the lens is set between 24-30mm. At a focal length greater than 30mm, distortion changes to pincushion (squeeze) style. Mounted on the D800, the worst barrel distortion shows at +1% in the corners at 24mm, and -0.1% pincushion over 50mm. These results are most noticeable in the corners. It's possible to correct for this distortion in image post-processing software, however, the prominent distortion throughout the image is barrel; thus, after 30mm, the distortion profile is somewhat complex. It could be tricky to get your straight lines truly straight. As an AF-S lens, autofocus operation is quick and virtually silent, going from close-focus to infinity in less than a second. The 24-85mm will work on all Nikon camera bodies that support SWM (silent wave motor) lenses. Autofocus results can be overridden at any time by simply turning the focus ring, and attached 72mm filters will not rotate. The lens provides average results for macro, offering 0.22x magnification and a minimum close-focusing distance of 38cm (just over a foot). The Nikon 24-85mm ƒ/3.5-4.5 VR is a built with a durable plastic construction, finished with a matte black texture. The lens mount is metal and the 72mm filter threads are plastic. The lens comes with a petal-shaped hood. The lens features a switch to disable autofocus (''M/A - M'') and a distance scale marked in feet and meters, located under a clear plastic window. There are no depth of field markings, or an infrared index mark. As a G-series lens, there is no aperture ring. The lens also features seven rounded aperture blades. One other switch is present, one to enable or disable vibration reduction; however, unlike other lenses with VR, this lens does not have a switch to toggle between active (4-axis) and normal (2-axis) stabilization. The zoom ring is the larger of the two, mounted towards the end of the lens. The ring is 3/4 inch wide, made of a tactile rubber, and surfaced with raised ribs. The zoom ring is nicely cammed: it takes two fingers to move the ring through the ninety degrees of turning radius. At 85mm, there is significant lens extension, as the lens adds 1 1/4 inches to its overall length. The focus ring is plastic, 3/8'' wide and textured with raised ribs. The ring is mounted closer to the lens mount. The ring takes about ninety degrees to run through the focusing range, but there are no hard stops at infinity or close-focus; rather, there is a slight increase of resistance to let you know you're at the end. There is some additional room at infinity to allow for focusing at different temperatures. The front element does not rotate during focus or zoom operations. The petal-shaped HB-63 lens hood reverses onto the end of the lens for storage; the interior of the hood is a smooth, matte finish. The lens is 2 1/4'' long, adding 2'' to the overall length of the lens when attached. We're still in the process of our image stabilization testing with this lens, and we will be posting the results of those tests shortly. At about the same price, the 24-85mm ƒ/2.8-4D doesn't have the 12 years of technical innovation under the hood, including VR; however, it does have a slightly faster maximum aperture and a much more capable macro feature. We haven't yet tested this lens. Double the price gets you a bit longer on the tele end, a bit sharper performance and a constant ƒ/4 aperture. For about three times the price you can opt for the pro alternative, which offers a constant ƒ/2.8 aperture and much sturdier build quality. Performance is also there in spades: the 24-70mm is much sharper on an aperture-for-aperture basis, CA is less objectionable, and distortion is better-controlled. However, VR is not present on this lens. Sigma doesn't offer a comparable 24-85mm, but it does offer an inexpensive 24-70mm ƒ/2.8, which while not quite in the same league as the Nikon 24-70mm fares very well in comparison to the 24-85mm ƒ/3.5-4.5. In this case, the central region is very sharp, but get ready for some interesting corners, as there is plenty of corner softness, CA and vignetting to contend with. The Nikon 24-85mm ƒ/3.5-4.5 VR is a capable kit lens, offering very good results on a D800 and excellent results on a D7000. While it isn't the sharpest offering available for full-frame, it's the most economical, making it the go-to option for someone wanting to get a full-frame lens without paying the premium price for a professional lens. reviews tend to be all over the place for this lens. I purchased an early release, and it proved to be a sharp lens with weak corners on my D800E. Others with this lens have found it disappointing, so it's worth testing before purchasing. It's best at 24mm--holds its own against the 14-24mm especially at distance--and stays very strong through 35mm. There is IQ drop off above 50mm, but it's plenty acceptable through 85mm. Sides and corners are disappointing, though, so you need to stop down substantially for landscape shots. Bokeh (out-of-focus rendering) is god-awful. If you are getting into FX on a tight budget, and/or simply looking for a light-weight "walk around" lens, then this lens is worth it especially at the $300 current price. 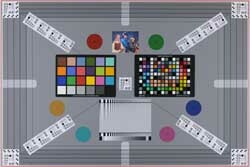 However, if you want to get the maximum quality out of your FX camera purchase look elsewhere. Available prime lenses in this range are amazing, so why not? Much sharper on DX camera than FX. I've now been able to test my two examples of this lens extensively in the field, in museums in L.A., Berlin and Moscow. It's actually a pretty good lens for museum shots with my D7200 and D7500s. It could be a bit sharper, but I'm generally happy with the hundreds of museum images I've now taken. It still doesn't seem to be very good for outdoor shots. I can't explain it, but resolution seems not as good with shots at normal landscape ranges as it is indoors closer to the subject. I'll keep these lenses, but will only use them for museum and other indoor photography. I sold the D610 and original 24-85 lens awhile back, now. I didn't like the image quality of this lens on that camera. Then I read that on a DX camera, it's much sharper. So I bought another one, and then another (they're cheap, used), and tested them on my D7200 and D7500s. I'm surprised at how sharp they are on DX cameras at f/8 or even f/5.6. So I recommend this lens much more for a good DX format camera, with no AA sensor filter, than for a relatively inexpensive FX model with AA filter. I now have one of these for my D7200 and another for one of my D7500s as great walkabout lenses in my "here" and "travel" bags. With a Kenko 1.4x TC in my pocket...yes, one in each bag...I have the full range from 24-120mm. Not perfect for full frame cameras, despite being kit lens for D600! I chose this for my full frame D600 for general use, because the 24-120mm f4 is bigger, heavier and twice as expensive, and according to several tests not much better - and soft above 85mm. It is quite sharp and contrasty, but for distant subjects even at f5.6 only the central field is rendered critically sharp, closing in reduces the problem. The VR seems to work quite well using the lens element decentering method that most likely results in the observed asymmetric image field sharpness (one image edge region less sharp than the opposite), so it's best left off when not needed. Apart from the limitations already mentioned, it's an OK all round lens. The problem is really not the lens as much as the full-frame camera in general, which demands much larger and costlier lenses for good results than those needed for the smaller formats. At today's rate of image-sensor development, the APS-C format only lags about one generation behind the FF performance; making the smaller format a practical proposition for most purposes. This lens is a very good APS-C alternative; scoring one or two points more on image quality. The old disreputable AF24-50mm f3.3-4.5 (1987 version) seems to perform just a tad better edgewise than this new 24-85mm VR lens, while the contemporary AF35-105mm f3.5.4.5 is quite sharp almost to the corners, and the macro at 105mm is extremely sharp, but works only in MF. PS - I bought the new D600 for my rather large collection of idle old Nikkors (25 lenses of which 11 fits this camera - 7 is AF). It is the first sensible priced FF Nikon DSLR-camera for old 35mm film users! It came rather late though - I switched to the Sony Alpha system in the mean time, and I don't regret it. Note November 2013 - Although I'm quite happy with this zoom lens, I'm not satisfied with the edge sharpness for landscape and city photography. The only lens I've tested successfully so far for city scapes on the D600 is the old manual focusing Nikkor 50mm f1.8 E, which I picked up secondhand some twenty years ago; the result is comparable to that obtained with the Sony a77 and Sony 35mm f1.8. Note spring 2014: The new 16 Mp Nikon Df would have taken all my 25 Nikkors due to the ability to flip away the small AI aperture coupling tab that otherwise would interfere with the older lenses. However, it is only 7.1Mp in DX mode and I don't particularly like it. It is a petty decision not to incorporate this feature on the D600. This new lens has dreadful field curvature and distortion. The results on a D800 are the worst I have ever seen from any lens I have used on any full-frame camera. My sample was much worse on the left side but it was impossible to cover anything more than the central ninth of the frame effectively even at f8 at 24mm, continuing the 24-70mm f2.8s deservedly poor reputation for field curvature, etc. the tops and bases of buldings and people are not sharp at wide-angle settings unless they are specifically focussed on, and then-even centre-frame the image, however well-focussed does not convince- reality is not resolved. Aghast, I phoned Nikon, only to be told they were not surprised as it is not recommended on a D800?D800E at all in any case- its not in their list. This means of course that it is unsuitable for ANY full-frame Nikon-as full-frame is full-frame, and results are visibly obviously no food on a D700 as well. No 24xxx zoom I have tried is-from Nikon. Including two 24-70mm f2.8s I purchased new with similar results due again to field curvature. At higher shutter speeds the VR makes things even worse-kinking straight lines at a 1/500th and curving them at a 1/250th and below. 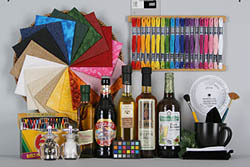 It is good only at a 60th and below on my sample-which I returned for a refund. In the UK even at the now lower price of £425 it is still double the cost of it predecessor secondhand, really not as "economical" as it is billed. £520 for a "kit" lens? Really! Bokeh is better on 24 - 70 / 2.8 but for more than double the price !! I've tested the 24-70 /2.8 and this Lens. If you want to shoot professional portraits you will have to go for the 24-70, but I was surprised by the sharpness and picture quality of this consumer Lens. Far better than the 18-200 ED VR which I was using most of the time. I've tested this lens on a D7000 without the VR the pictures are even sharper if your hand is not shaking. So I normally work without VR but it is a nice to have feature. If you are looking for a really good walkaround lens for your new D800e, this is it. It shows you all 36 MP through most of the frame. The VR works splendidly right down to about 1/20th. The 24mm setting is very good indeed. Minor corner CA, easily correctable. Some fairly heavy distortion at the ends, but can be tamed in Lightroom, etc. pretty well. Bokeh isn't bad. This is the "kit lens" of choice for the new hi res Nikons. Bravo! I received my D800 in May and did various s shots with my prime lenses but was really missing a wide to telephoto zoom for this camera. I almost went for the 24-120 VR but then this lens was announced and I went for it. I have to say, I am glad I did. At 24mm, this lens was equal or better than the 14-24 from F4 through F11. It was better than the 24mm F2.8 D prime. We are talking center and corners! At 50mm this lens was close to the 50mm F1.8, mostly lacking just a little in the corners. At 70-85mm this lens was at its weakest (at least compared to the 70-200 F2.8 VRII) but still quite acceptable. Color saturation and resistance to flare was very good. Distortion not so good but easily corrected for. Combine this excellent sharpness with VR , light weight, and low price and you have a real winner here. This thing is sharp as a tack. At the same aperture settings I can tell no difference between this lens and my Nikon 24-70/2.8. Really. Great color, light, I have been waiting for Nikon to come up with a good walk around casual lens for FX cameras and this is it. 80% of my shots are taken in this range, so for me this lens is perfect for street photography, weekend trips, vacation and family shots. With the VR I have been able to get shots hand held with shutter speeds as low as 1/4s . I absolutely LOVE this lens! No lens is perfect however...the zoom ring is a bit stiff and there is some funky distortion especially at 24mm (which once the lens profiles for PS and Lightroom are updated will not be an issue for me at all). I would highly recommend the lens.